Between 200 and 200,000 protesters gathered outside the DTE Energy headquarters in Detroit, Michigan. This DTE Energy protest was visited upon by two to 2,000 Occupy Toledo protesters. One unidentified protester, with a striking resemblance to Homer Simpson, wearing a notorious rainbow colored peace hand designed by Top Pun, showed his anti-nuke colors. 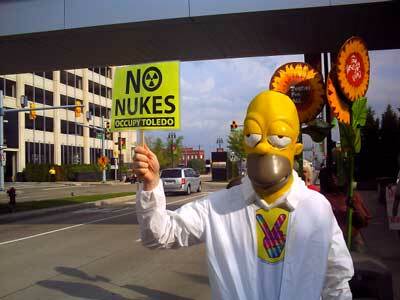 Another Occupy Toledo protester was less well disguised. 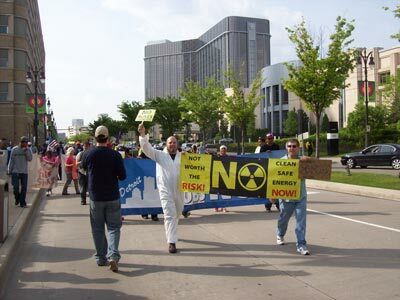 Michael Leonardi, pictured below, to the left, of course, can be seen waving his Occupy Toledo colors and anti-nuclear banner. Mr. Leonardi received some criticism from other protesters for leading the way, since the more numerous yet bland protesters may have missed their photo op. Mr. Leonardi bore this burden of leadership well and led despite his numerous followers. As Mr. Leonardi and the other alleged participant, a.k.a. Top Pun, came to this protest they made the obvious mistake of parking in the casino parking garage. The collusion of the purveyors of our casino economy had rolled out the concrete carpet that was a largely empty casino parking garage. This free parking was apparently not to be had by mere commoners or the general public. 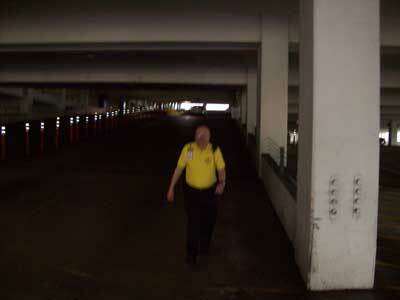 When we were spotted walking out of the parking garage with our fluorescent yellow Occupy Toledo signs and in our radiation suits, the very astute security recognized that maybe we weren’t there to gamble away our hard earned dollars. This special DTE Energy shareholder security made it clear that we were not welcome and told us that if we didn’t move the car that they would tow it. They were even kind enough to follow us out (pictured below) to make sure that no empty parking spots were harmed in the making of this fiasco. Hear, hear, the last thing any anti-nuclear protesters want to do is have anybody take any unwarranted risks, like, say, storing 550 tons of nuclear waste in a five-story building that can’t be offloaded as built without knocking the building over.